To reach the Paris Agreement climate goal, and stay under 2°C warming, emissions will need to peak in the coming years and be reduced to zero by 2050. China, India and the US play a key role in achieving this target as they emit over 50% of the global CO2emissions and are by far the largest markets for renewable energies. The Allianz Climate & Energy Monitor Deep Dive report aims to inform investors and policy-makers on the scale of investments needed in China, India and the US to be in line with the Paris goals; and what recent developments, especially regarding the leadership change in the US, mean for investing in renewable power in the future. Investments in China and the US need to roughly double, in India even triple, to remain within the Paris Agreement warming limit. Renewable power investments will need to rapidly grow in the coming two decades to be in line with the Paris Agreement targets. According to UNEP and Bloomberg NewEnergy Finance (BNEF), in 2016, combined investments in renewable electricity in China, Indiaand the US amounted to USD 134 billion. These accounted for over half of the global investments in electricity supply in2016. China and India are currently well on track to achieve their climate targets set for the Paris Agreement. China aims to increase the renewable energy capacity by 38% in 2020 compared to2015 levels, equaling 680 Gigawatt (GW) of installed capacities and investments of USD361 billion in renewable energies. For comparison: Germany, which ranked first in the Allianz Climate & Energy Monitor 2016 for its renewable energy policies, currently has roughly100 GW renewables installed. A new park of 10 wind mills has around 0.04 GW of capacity. 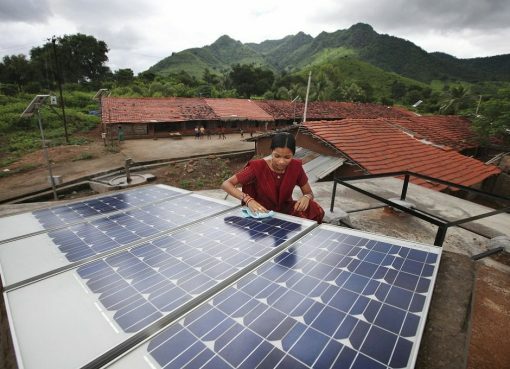 India is also developing its renewable energy capacity at a rapid pace. In 2016, solar and wind installations exceeded the annual goal by 43% and 116% respectively. For 2022,India plans 175 GW of installed renewables. With market forces set into action by a clear policy intent, India is expected to comfortably achieve its climate targets. Both countries are looking to exit coal-based power generation: China is cancelling plans for new fossil-based power plants and swiftly decommissioning existing coal power plants, while India is considering plans to stop building new coal power plants after 2022. In the US, renewables are booming with more than 16 GW of wind and solarcapacities installed in 2016, accounting for 60% of all new capacity (27 GW). This has been driven by ambitious Renewable Portfolio Standards in various US states and tax credit schemes on federal level as well as the decline in costs for renewables. “Rapidly falling technology costs for renewables and strong investment conditions at the state-level continue to make the US attractive for institutional investors like Allianz, despite a constraining outlook on support from the federal level from 2020 onwards”, says Thomas Liesch, Senior Project Manager at Allianz Climate Solutions. “With policy retrenchment beginning to take shape under an ‘America first’ energy blueprint, we expect China and India to outcompete the US – for the second-consecutive year – in providing an effective and reliable green policy environment”, says Ritika Tewari, Climate Policy Analyst at New Climate Institute. When Will Renewables Become The Dominant Source Of Energy?